This is not to criticize Dartmouth graduates who pursue careers in finance and consulting or the CPD for providing resources for them. Many students find rewarding careers in those fields, and it is fortunate that Dartmouth is able to provide them with this guidance. What is concerning about the CPD’s current focus on jobs in finance and consulting is its neglect of other sectors. Currently, the CPD’s website identifies only one staff member who specializes in pre-law advising. At the same time, it identifies three staff members as part of its “employer relations team.” Since the vast majority of those employers are in the financial services and consulting fields, it seems that the CPD expends more resources on helping students pursue these tried-and-true career paths. By not making active efforts to widen its scope, what message does the CPD send to students about the College’s priorities and end goal to learning at this institution? There is no shortage of students at the College who dream of working in law, public service, medicine, the nonprofit sector — the list goes on. However, many students perceive the CPD as being focused on finance and consulting, with far less to offer outside of those fields. Regardless of whether the CPD views this as a fair assessment, the reality is that even the perception that the CPD does not offer support for other career paths can affect students’ willingness to explore those fields. While the ultimate onus is on students to seek career paths of significance to them, and the CPD’s decisions may reflect a broader attitude among students that treats finance and consulting as the default, it is doubtful that 56 percent of Dartmouth students enter the College with a true passion for finance, consulting or technology. At Harvard University, according to a survey by the Harvard Crimson, only 16 percent of second-year students report that they are pursuing careers in finance or consulting. Among juniors, the same figure more than triples to 57 percent. The same survey found that Harvard’s Office of Career Services was a common source of first exposure to these fields. While there is currently no comparable data available for Dartmouth, it is possible that the CPD serves a similar role here. Though many students gain awareness of finance and consulting as their college careers progress, more than a few undecided students likely find themselves defaulting into those industries because of the availability of resources. The CPD needs to recognize the role it plays in affecting students’ futures and focus its advising on career exploration, offering students genuine options outside the finance-consulting sphere. If a lack of representation from the public sector is attributed to costs of attendance or ability to be prominent at such fairs, the College should make efforts to subsidize the cost of campus visits for employers in other fields, especially non-profit organizations. Even if not through financial assistance, the CPD should be meeting the baseline of making efforts to bring a diverse cohort of employers to campus. Ultimately, this discussion funnels into a larger question about Dartmouth’s bottom line. By focusing career advising on finance and consulting, Dartmouth helps to channel students into high-paying careers, which elevates the College’s reputation in the private sector and creates opportunity for large donations later on. It also improves Dartmouth’s performance in rankings that consider alumni salary data — one of the many benchmarks that seem to be used to judge the quality of higher institutions. Indeed, the College ranks 15th for highest alumni salaries on Payscale’s 2018 College Salary Report, higher than all but two of its Ivy League peers. While these reputational benefits can be positive, and donations can ultimately support growth of the College, should we be conflating the benefits that come with financially successful alumni with the futures of students? The CPD has a great mission statement: Dare to be different. 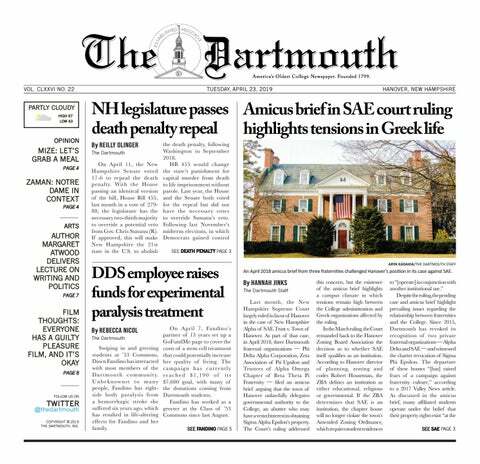 For all the power and prestige that the Dartmouth name provides, the core mission of the College is to educate students and encourage them to pave their own paths, whatever they may be. Dartmouth needs to reinforce its core educational mission in career advising. After all, if students aren’t the College’s bottom line, then what is?